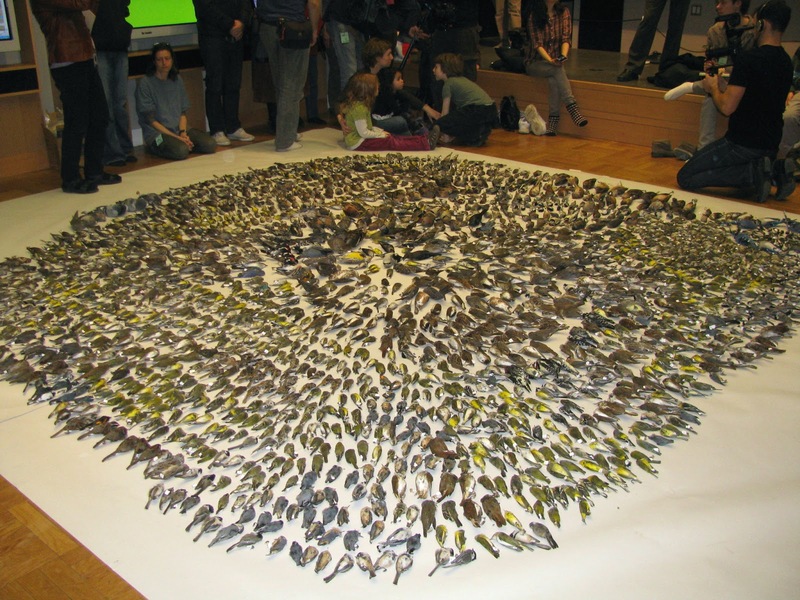 2400 birds (91 species) who didn't survive migration. Yesterday on my lunch break I walked across the street to attend FLAP's annual "dead bird layout" at the ROM. It's a public awareness program, to make the public aware of the dangers migratory birds face every year just trying to make it through our city. 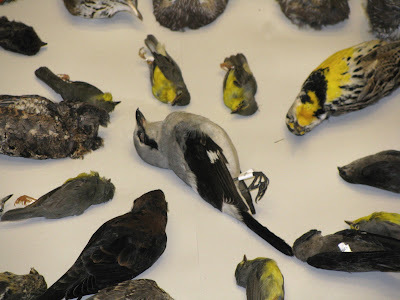 Lights left on in city buildings at night and reflective glass are deadly to the birds. 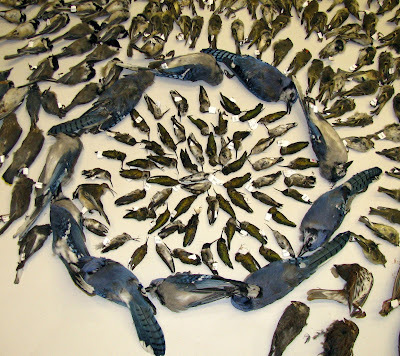 The 2400 birds pictured above is a small sample of the estimated 1 Million birds that die in our city every year. I wanted to go to show my support for this organization, but it was tough to see, and I teared up a few times, first time when I spotted my "wish bird", a Whip-poor-will, in the mix. I stayed for the speech given by Founder, Michael Mesure, and was surprised to learn that FLAP has been around now for 25 years. I applaud this organization for their dedication and hard work, they are making a difference. For more information on FLAP, please check out their website by clicking HERE. A Northern Shrike was in the very middle of the group. 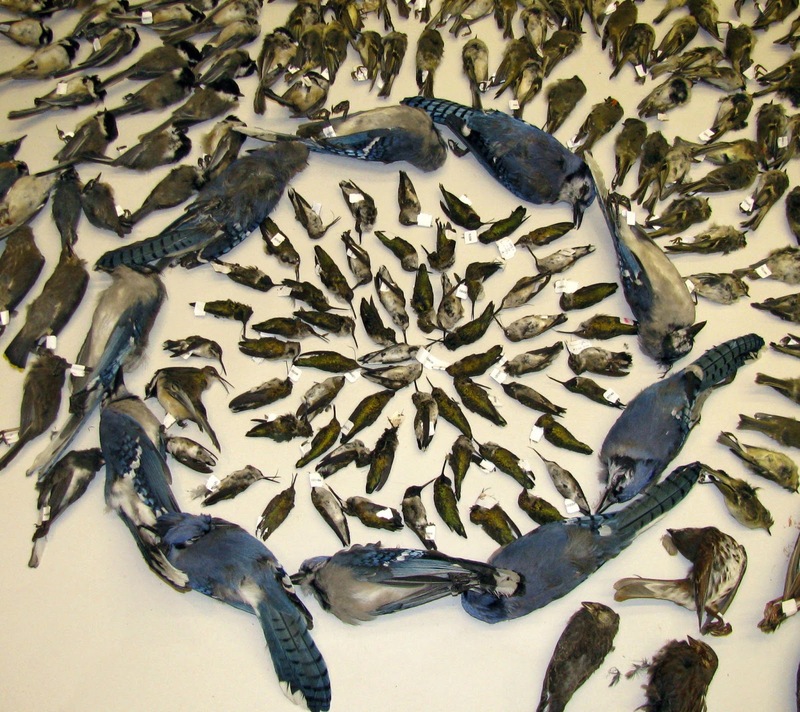 A circle of Blue Jays around a group of Ruby-throated Hummingbirds. This isn't how I like to see birds, but I am grateful to everyone at FLAP for working so hard to lesson the number of birds killed every year. Would'a been very tough to see this; although the meaning behind this is good (what they are educate people). A drastic way of getting the message out :( So sad to see so many die.